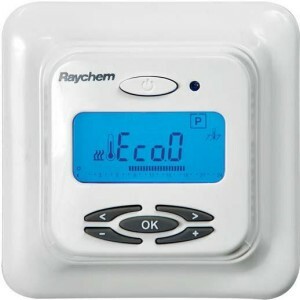 The Raychem NRG Thermostat is a digital timer thermostat for floor sensing or/and room sensing applications including min. and max. floor temperature limitation function. 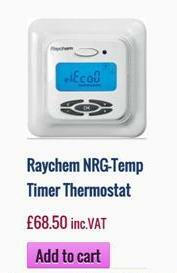 Raychem NRG Thermostat has an intelligent adaptive function which calculates when the heating is to be switched on to make sure that the comfort temperature is reached when required. Room sensing with min./max. floor temperature limitation e.g. for wooden floors. Floor sensor with 3 m cable NTC, 10KΩ / 25°C. Maximum length of floor sensor cable: 100 m, 2 x 1,5 mm² (230VAC cable type). Dimension with frame H 82 x W 82 x D 57 mm. Colour Polar white RAL 9010. Floor sensing hysteresis 0,5°C (Factory settings adjustable between 0,2-2,0°C).